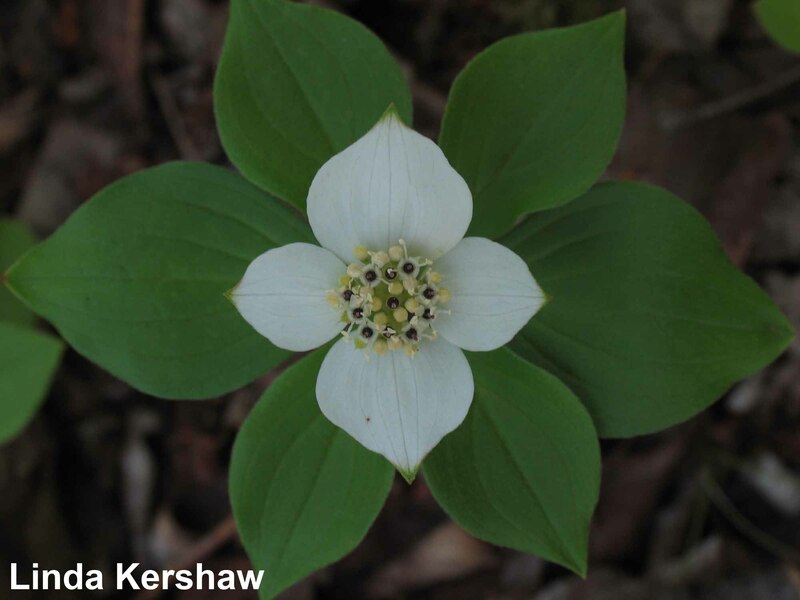 Cornus canadensis – Tiny insects can trigger an explosive opening of mature bunchberry flowers, and are showered with pollen as they fly away. 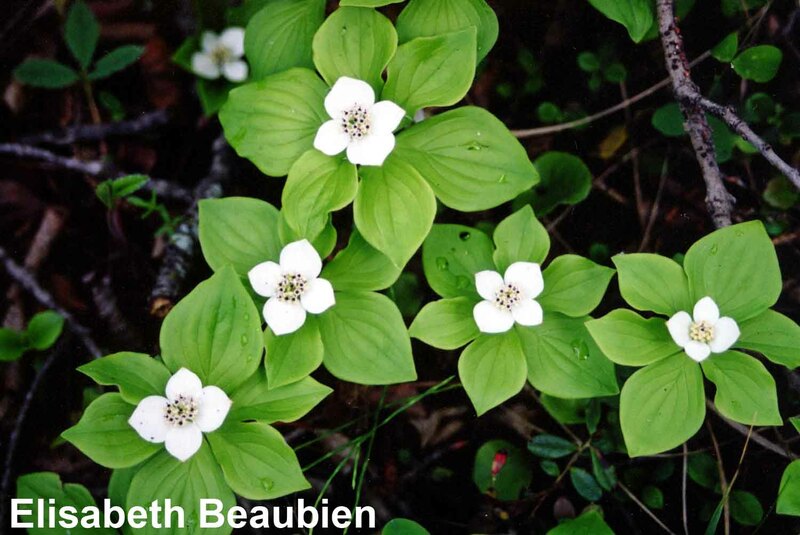 Form: Like a Pacific dogwood in miniature, the bunchberry has erect flowering stems, entire leaves that have only a few main veins, and numerous small flowers surrounded by the conspicuous petal-like white bracts. Stems are 8 to 15 cm tall. Plants grow from slender creeping rhizomes, carpeting the forest floor in moist coniferous woods. Leaves: Each stem has 4 or 6 smooth-edged leaves at the summit of the stem. These upper leaves are green above and whitish beneath. They are oblong, egg-shaped and pointed, and about 3 to 8 cm long. A characteristic feature is the way the lateral veins arise from the midvein in the lower third of the leaf. Another, smaller pair of leaves is found at about the middle of the stem. Flowers: What looks like the flower of this plant is in fact not the flower but bracts (modified leaves). The four creamy-white bracts 10 to 25 mm long surround the cluster of true flowers, which are found in the button-like disk at the centre. Each tiny white or greenish flower has 4 tiny petals, 4 stamens and a straight pistil. Open flowers can be recognized because the black stigma at the base of the pistil (female part of flower that later forms a berry) is then visible in the centre of each flower. So, white flower buds = closed flowers, and black spots = open flowers. Fruit: The berries are a brilliant scarlet-red, developing by August. Each berry, called a ‘drupe’, has a 1-2 seeded stone. 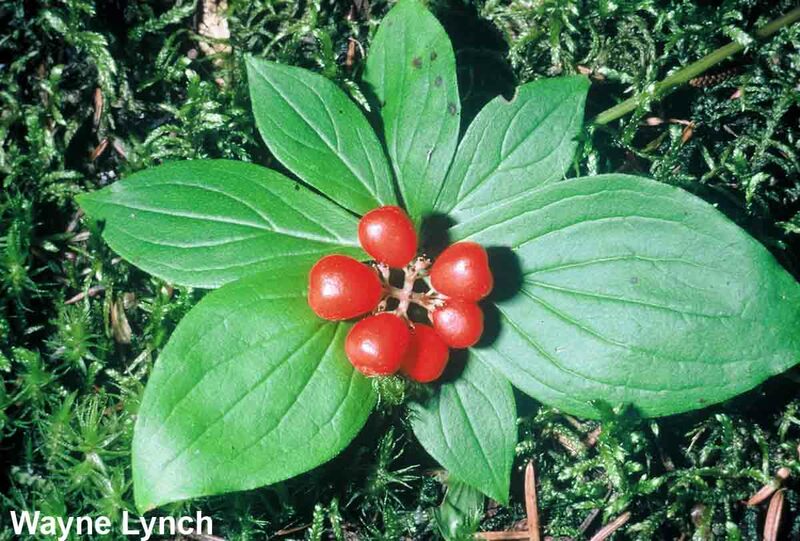 The berries are grouped together in a dense head at the top of the stem (hence the common name, bunchberry). Common in shady and cool, moist woodlands, especially coniferous forests. It often grows on stumps or rotting logs. 1. Mark a plot of bunchberries, about one metre by one metre in size, to observe. * First bloom: In at least 3 places in the patch of plants under observation the first tiny central flowers have opened completely; in these flowers the black stigmas should be visible between the unfolded petals. * Full bloom: Approximately half (50%) of the flowers on the plants under observation are open. 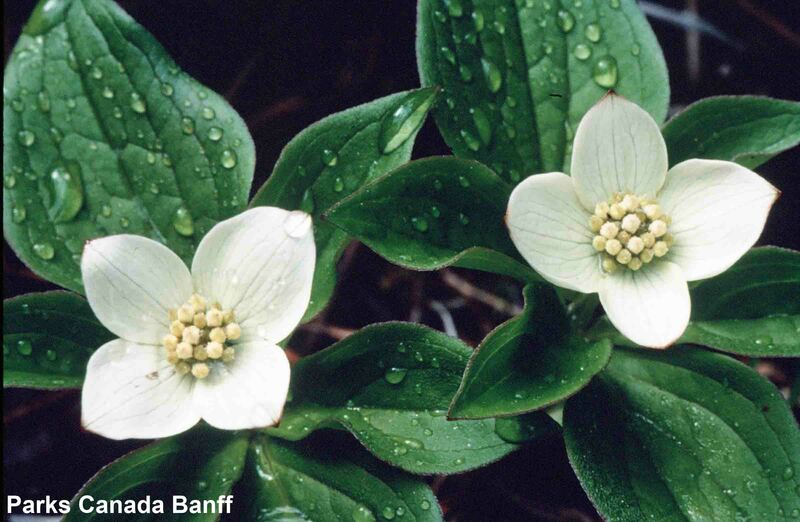 Bunchberry flowers in May or June, although often somewhat later in the mountains and the far north. 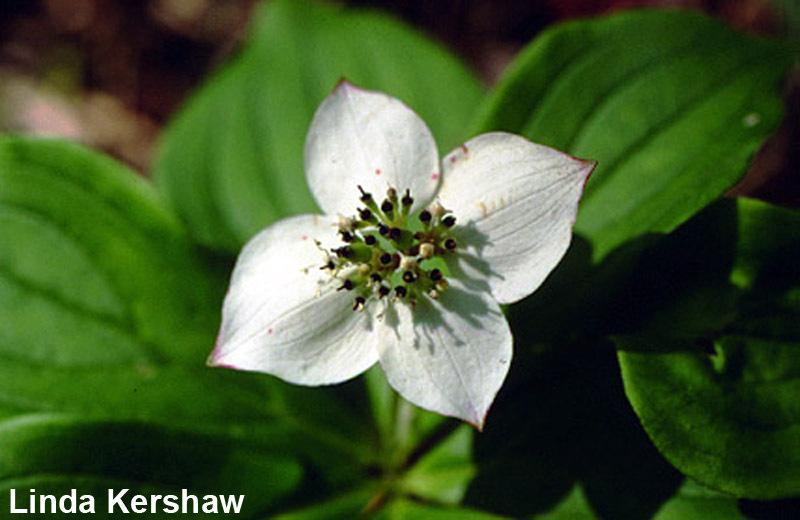 When the white bracts fall, the central flowers develop into the bunched bright red berries. 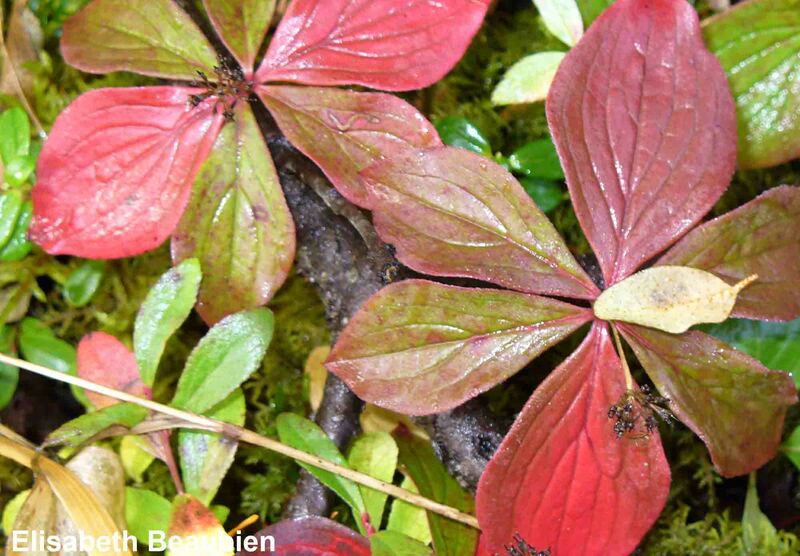 Bunchberry frequently flowers a second time, in the fall. Bunchberry has an exciting way to increase the chances of flower fertilization: explosive pollination! The four white bracts turn from green to white to signal pollinators to come visit the tiny flowers in the centre. Each of these tiny central flowers has 4 closed petals forming a white bud. One petal has a hair-like trigger: a tiny antenna about 1 mm long that projects from near the tip of the petal. When a small insect touches the trigger on a “ready to bloom” flower, the petals bend back instantaneously, and the anthers spring out, catapulting the load of pollen into the air and onto the passing insect. The berries are much loved by deer, grouse and songbirds. They were an important food source for the now extinct passenger pigeon. Under low light conditions and high soil acidity, the bunchberry produces little seed, and reproduces mainly from rhizomes. The berries were eaten and preserved for winter use by some First Nations Peoples, but considered dry and insipid by others. The flavour may vary with climatic conditions. The roots have been used as a cold remedy, and the bark has been used as a laxative. Other potential uses of the plant are as an anti-inflammatory and analgesic. The Cree name comes from the facial irritation caused by the tiny white hairs on the fruit. If the berries are rubbed on the skin they give a prickly feeling. In New England, the berries have been used as an ingredient in plum pudding, and there the plant is frequently called ‘pudding-berry’. An excellent garden species. Use plenty of humus and rotted wood. The plant will thrive in a shady spot of the garden, given a mulch of pine needles and sufficient moisture. Cody, W.J. 1996. Flora of the Yukon Territory. NRC Research Press, Ottawa. Hitchcock, C.L. and A. Cronquist. 1973. Flora of the Pacific Northwest. Univ. of Washington Press, Seattle. Hultén, E. 1968. Flora of Alaska and neighboring territories. Stanford University Press, Stanford, California. Kershaw, L. 2000. Edible and medicinal plants of the Rockies. Lone Pine Publishing. Edmonton. MacKinnon, A., J. Pojar and R. Coupe. 1992. 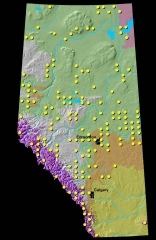 Plants of northern British Columbia. B.C. Ministry of Forests and Lone Pine Publishing. Marie-Victorin, F. 1964. Flore Laurentinenne. Les Presses de l’Université de Montreal. Montreal. Marles, Robin J. et al. 2000. Aboriginal plant use in Canada’s Northwest Boreal Forest. Natural Resources Canada. UBC Press. Vancouver. Mosquin, T. 1999. The explosive pollination mechanism in Chamaepericlymenum canadense L.
a) ‘Menziesia’ Vol. 4 (3): 10-12. NPSBC, Native Plant Society of British Columbia. b) 1985. Canadian Field Naturalist. Vol. 99, #1, Jan.-Mar. Wilkinson, K. 1999. Wildflowers of Alberta. Univ. of Alberta Press and Lone Pine Publishing, Edmonton.